You know it’s truly the eve of Armageddon when even Bigfoot packs up and ships out to the next planet over. 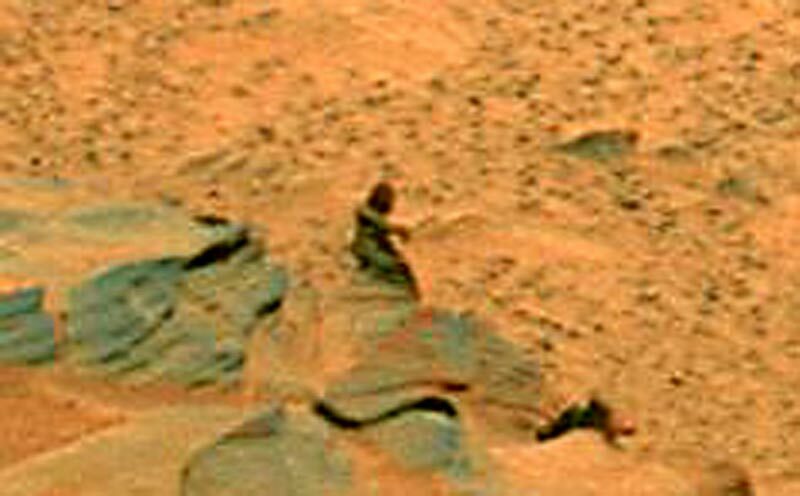 The Internet is abuzz with a recent picture released by NASA–a picture that seems to show an alien lady or Bigfoot waiting on a rock. Or it could be just a weird rock with a scraggly jutting formation, but that’s clearly not the case. The real-size picture shows hardly a sign of our hairy friend, but when has Bigfoot ever been easy to find? OK, so most level-headed people will agree that it’s a trick of the eye, hopefuls finding meaning in some brown dots, and yes, that’s completely true. But c’mon, it totally looks like Bigfoot is checking his watch! Did the redpen censor guy at NASA let this one through purposefully? I can just see the sceptics over doing summersaults for a plausible explanation, a chinese lantern? Swampgas? What will they come up with? Appreciating the persistence you put into your blog and in depth information you present. It’s good to come across a blog every once in a while that isn’t the same unwanted rehashed information. Fantastic read! I’ve bookmarked your site and I’m including your RSS feeds to my Google account. I’ll right away grasp your rss feed as I can’t in finding your e-mail subscription hyperlink or e-newsletter service. Do you’ve any? Kindly permit me recognise so that I could subscribe. Thanks.